Bon Jovi have announced 5 live dates at the O2 Arena, London next summer on the back of their eagerly-awaited new album "The Circle" (due out Nov 2). Tickets will go on sale on Friday 30th October (24th for O2 customers), ranging from £45 to £200(!) + booking fee. The dates are June 7th, 8th, 10th, 11th and the 13th - which curiously leaves a couple of days free in amongst those gigs, so keep 'em peeled for possible further live activity. 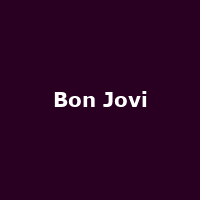 Bon Jovi are one of the most successful rock bands, whose appeal has crossed-over to the mainstream and back again. Their biggest hits have been "Livin' On A Prayer", Keep The Faith" and "It's My Life" and will celebrate 25 years of hits next year. "....Prayer" even made the charts last year as a download in its own right, 22 years after its initial release as a 7" single.